Wilson completed 14 of 17 passes for 248 yards and three touchdowns in Sunday's 28-14 win over the Lions. He also ran twice for 15 yards. Analysis: The Seahawks focused on the run yet again, rushing the ball 40 times and allowing Wilson to attempt just 17 passes. Wilson was still quite productive with a season-high 14.6 yards per attempt. The commitment to the run hasn't hurt Wilson yet, as he has attempted less than 23 passes in each of the last three games but still has still thrown for three scores each of those contests. Wilson completed 17 of 23 passes for 222 yards, three touchdowns and an interception against the Raiders in London on Sunday. He also rushed six times for 20 yards in the 27-3 win. Analysis: Wilson connected with Jaron Brown (five yards) and David Moore (19 yards) for a pair of first-quarter touchdowns, then added a 10-yard score to Tyler Lockett early in the fourth quarter. Though Wilson's only exceeded 226 passing yards once in six games, he's managed to throw multiple aerial scores in all but one game this season. He'll get a bye in Week 7 as the Seahawks make their way back stateside. 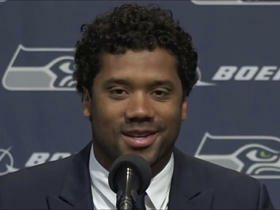 Wilson completed 13 of 21 passes for 198 yards and three touchdowns in Sunday's 33-31 loss to the Rams. Analysis: With Seattle's ground attack having another productive game, Wilson didn't need to air it out much, recording a season low in pass attempts. 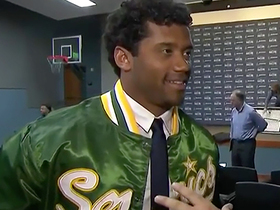 He did throw a number of beautiful deep balls, including a 44-yard pass and 39-yard touchdown to Tyler Lockett. After failing to throw a touchdown in Week 4 at Arizona, Wilson obviously rebounded nicely, although Doug Baldwin (knee) has not gotten on track yet, catching his lone target for one yard. In Week 6, Wilson will play the Raiders on the road. Wilson completed 19 of 26 passes for 172 yards and zero touchdowns in Sunday's 20-17 win over the Cardinals. He also ran four times for 21 yards. Analysis: Wilson finally had some run support in the backfield as Mike Davis, who was playing because Chris Carson (hip) was inactive, racked up 101 yards and two touchdowns on the ground. Therefore, the veteran signal-caller didn't have to put the team on his back. Wilson had some breathing room, too, as he was sacked just twice for the second straight game after being dropped six times in each of the first two contests. He'll have a tough matchup against the Rams in Week 5. Wilson completed 16 of 26 passes for 192 yards and two touchdowns in Sunday's 24-13 win over Dallas. 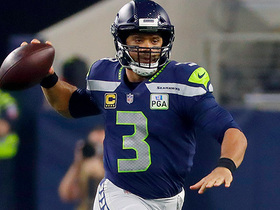 Analysis: Wilson has put up respectable fantasy numbers thus far -- seven touchdown passes -- especially given the state of Seattle's offensive line, lack of a ground game and missing Doug Baldwin (knee). The running game finally got on track a bit, though, as Chris Carson ran for 102 yards Sunday, although it took him 32 carries to get there. Surprisingly, Wilson hasn't done much as a runner himself, rushing for just 21 yards in three games. In Week 4, Wilson will take on the Cardinals in Arizona. Wilson completed 22 of 36 passes for 226 yards, two touchdowns and one interception during Monday's 24-17 loss to the Bears. He also ran three times for 17 yards. Analysis: Both touchdown passes came in the fourth quarter, including a floating dime to Tyler Lockett in the back corner of the end zone. However, it was another game under siege for Wilson. He was sacked six times for the second straight outing and lost one fumble in the process. It was clear Wilson was trying to do too much with an unimproved offensive line, an underwhelming run game and no Doug Baldwin (knee). The Seahawks will host the Cowboys in Week 3. Wilson completed 19 of 33 passes for 298 yards, three touchdowns and two interceptions during Sunday's 27-24 loss to the Broncos. He also rushed twice for five yards. Wilson will have five healthy receivers Sunday against the Broncos since Doug Baldwin (knee) has been a full participant in practice this week, John Boyle of the Seahawks' official site reports. Analysis: Healthy may be a loose term when it comes to Baldwin, who deemed himself as "85 percent." Still, Wilson will need every possible target he can get in Week 1, as the vulnerabilities of the Seahawks' youthful defense could cause him to throw the ball early and often. Wilson draws a tough matchup against the Broncos, who ranked fourth in the league last season with 200.6 passing yards allowed per game and added pass rusher Bradley Chubb in the first round (No. 5 overall) of April's draft. Wilson completed 11 of 21 passes for 118 yards during Friday's preseason game against the Vikings. He also rushed once for five yards. Analysis: On a night without receivers Doug Baldwin or Tyler Lockett, Wilson was lacking reliable weapons downfield, and it showed in his final stat line. However, this isn't what should be expected in the regular season when both of his top targets are expected to be available. 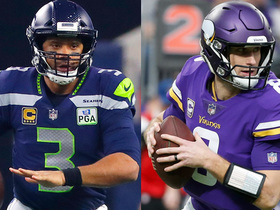 In fact, Wilson is being widely discussed as one of the favorites to win the MVP award this season coming off a 2017 campaign in which he led the league with 34 passing touchdowns. Coach Pete Carroll said Wilson is expected to play into the third quarter of Friday's preseason contest in Minnesota, Brady Henderson of ESPN.com reports. 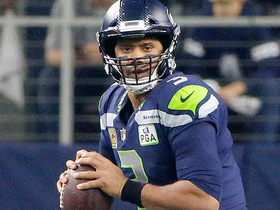 Analysis: Through two exhibitions, Wilson has directed the Seahawks offense to one touchdown and two field goals on seven possessions. Overall, his stat line is more or less in line with what's expected -- 17-for-26 passing for 236 yards and one touchdown versus no interceptions, plus three carries for 18 yards -- especially with Doug Baldwin unavailable due to a knee injury. Wilson is now poised to see his most significant run before the arrival of Week 1. Wilson completed 13 of 21 passes for 193 yards and no touchdowns or interceptions in Saturday's 24-14 preseason loss to the Chargers. Analysis: Wilson played the entire first half against a Chargers defense that ranked third in passing yards allowed last season. Although the four-time Pro Bowler's stat line wasn't anything special, fantasy owners shouldn't worry. Wilson didn't have his top two wideouts available, as Doug Baldwin (knee) and Tyler Lockett (foot) both sat out. Wilson has now converted 17 of 26 throws for 236 yards, one touchdown and zero interceptions through two preseason games. 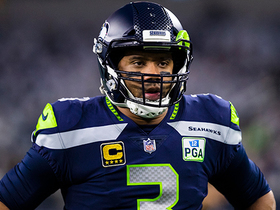 Wilson expects to sign a franchise tag with the Seahawks after his contract expires in 2019, Kole Musgrove of USA Today reports. 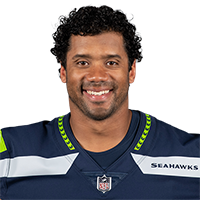 Wilson led the NFL and tied a team record with 34 touchdown passes in 2017, but it was partly a result of an inept running game as he posted career lows in completion percentage (61.3) and yards per attempt (7.2). 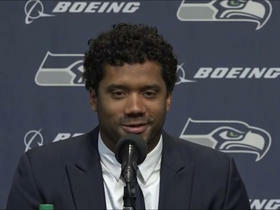 Wilson completed 18 of 29 passes for 221 yards and two touchdowns during Sunday's 26-24 loss to the Cardinals. Wilson completed 14-of-21 passes for 93 yards and two touchdowns against Dallas on Sunday, adding 29 yards on nine carries. Analysis: Wilson dealt with occasional disruption from a pass rush led by the great Demarcus Lawrence, and otherwise couldn't find any downfield cracks in the Dallas defense. It's an outcome that's difficult to understand given the underwhelming cornerback personnel in Dallas, but Wilson should show better against the Cardinals in Week 17. Wilson completed 14 of 30 pass attempts for 142 yards and a touchdown in Sunday's 42-7 loss to the Rams. He added 39 yards on five rushing attempts. Analysis: Wilson had not thrown for fewer than 200 yards or two touchdowns in a game since the last time he faced the Rams in Week 5. The 29-year-old was sacked seven times and was on the run all day. If there is a bright side for the six-year veteran, it's that he led Seattle in rushing. He will look to rebound in Week 16 at Dallas. Wilson completed 17 of 31 passes for 271 yards with three touchdowns and three interceptions in Sunday's 30-24 loss to the Jaguars. He also rushed five times for 50 yards. 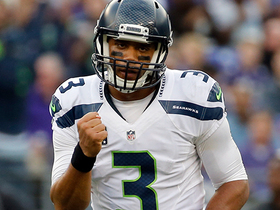 Wilson completed 20 of 31 passes for 227 yards and three touchdowns during Sunday's 24-10 victory over the Eagles. He added 31 rushing yards on six carries. Wilson connected on 20 of 34 passes for 228 yards, two touchdowns and in interception during Sunday's 24-13 win over the 49ers. He added 25 yards rushing and a touchdown on seven carries. Wilson completed 26 of 42 passes for 258 yards, two touchdowns and an interception in Monday night's 34-31 loss to the Falcons. He also rushed seven times for 86 yards and another score, but had a fumble returned for a touchdown. Wilson (jaw) said he couldn't eat solid foods for a few days after last Thursday's 22-16 win over the Cardinals, Brady Henderson of ESPN.com reports. The Seahawks violated the NFL's concussion protocol in the third quarter Thursday's win over the Cardinals after allowing Wilson to reenter the game without first going to the locker room and receiving clearance from a team doctor and independent physician, a source informed Adam Schefter of ESPN.com reports. Wilson said he passed a concussion test during Thursday's 22-16 win over the Cardinals, Bob Condotta of The Seattle Times reports. 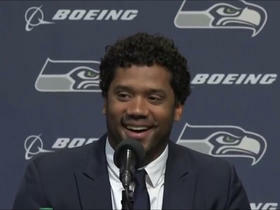 "I got smacked in the jaw pretty good there,'' Wilson said. "I wasn't concussed or anything like that. I felt completely clear. I was just trying to move my jaw." Wilson completed 22 of 32 passes for 212 yards with two touchdowns and no interceptions in Thursday's 22-16 win over the Cardinals. He also rushed five times for 19 yards and fumbled once. Wilson completed 24 of 45 passes for 297 yards, two touchdowns and two interceptions in Sunday's 17-14 loss to the Redskins. He also added 77 yards on ten rushing attempts. Analysis: Seattle struggled on offense for the first three quarters, managing just three missed field-goal tries. Suddenly, things clicked to begin the fourth, as Wilson led a 66-yard drive in under three minutes that ended with Luke Willson's touchdown catch. The 28-year-old later engineered a go-ahead drive culminating in a 30-yard strike to Doug Baldwin, but it didn't turn out to be enough. The Seahawks will travel to Arizona to take on the Cardinals in Week 10.